Small but definitely not lost in a crowd, the Downy Woodpecker is our February 2014 feature in the 12 Months of Birding at the Inn series on our blog. The Downy Woodpecker is black and white, with a splotchy or checkered-looking pattern on its wings, a white stripe down its back, and a black-and-white striped head. Males have a red patch on the backs of their heads. The Downy Woodpecker closely resembles the Hairy Woodpecker, but the Downy Woodpecker is only about one-third the size of a Hairy Woodpecker, more like the size of a White-Breasted Nuthatch. 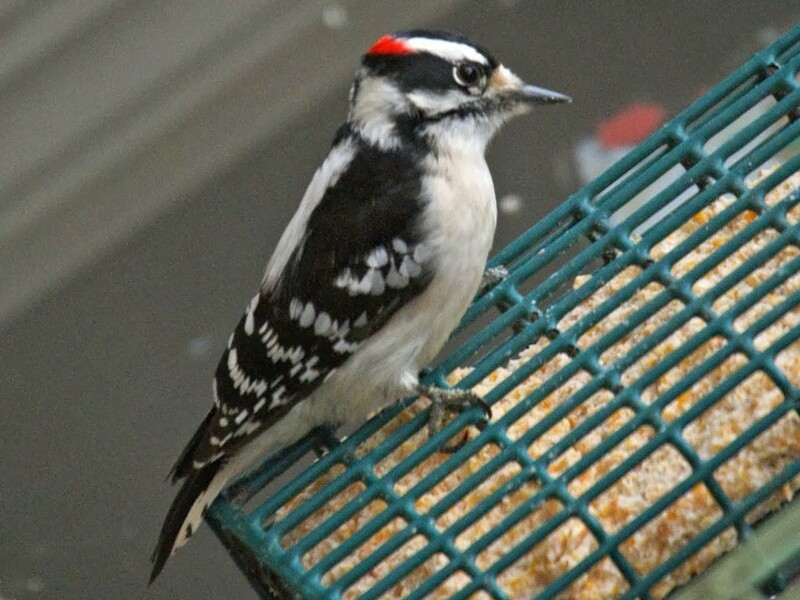 Even though its diet consists mainly of insects and insect larvae, the Downy Woodpecker is a big fan of suet and will also snack on black oil sunflower seeds with the chickadees and nuthatches at the feeders. They also eat berries and acorns. We most often see them in our apple orchard or around the trees bordering the orchard at the Inn. Downy Woodpeckers are year-round residents of most of the continental United States. The Downy Woodpecker doesn’t really have a song, but it does have a short, sharp whinnying call that starts with high-pitched chirps or “piks” that descend in pitch toward the end. Both males and females also rapidly drum on trees with their beaks to communicate with each other, to mark territory and attract mates.